Free parking is available. Enter our parking lot on 2nd Ave (see signs for Minuteman Press). Midway periodically sends out information about exhibitions and public programs to our announcement list. If you’d like to receive our emails, please sign up using the contact form below. Midway often hosts tours and presentations of our exhibitions and library for groups. If you would like to know more about our programs or schedule a visit, please contact us. Midway does not rent out our space to individuals, organizations, or companies for events. Midway Contemporary Art is accessible to all visitors. Please feel free to contact us for more information, or to request specific accommodations, via email [email protected] or phone (612) 605-4504. Midway’s building is all on one level without stairs, and meets ADA accessibility guidelines. Staff are always available to help library visitors. Tables are wheelchair accessible and library users can access the internet via WiFi. Exhibition checklists and press releases are available in large print; audio, Braille or other formats are available upon request with at least 2 weeks advance notice. Midway’s event seating is movable and accommodates wheelchairs — requests do not need to be made in advance. ASL interpretation at talks and screenings is available upon request with at least 2 weeks advance notice. Our parking lot is free and accessible — there are no stairs between the parking lot and entrance. Enter on 2nd Ave SE. Midway Contemporary Art does not discriminate on the basis of disability, race, ethnicity, age, sexual orientation, gender, national origin, or beliefs in admission or access to, or treatment or employment in, its services, programs or activities. Midway is committed to making all programs and activities accessible to all participants, and we will accommodate all reasonable requests made by invited guests and visitors of any and all abilities. Midway staff maintains a commitment to help and inform visitors with accessibility needs. This policy was approved by Midway’s Board of Directors in January 2017. Our internship program is an opportunity to learn the workings of a nonprofit art space. Interns are regular volunteers with set weekly hours who do everything from help in Midway’s library to paint walls. Internships are typically offered on a semester basis; interns often earn college credit for their work although you need not be a current student to apply. If you are interested in being an intern at Midway, please send a PDF cover letter and résumé to [email protected] attn: Megan McCready, Associate Director. Midway’s programming is made possible through the efforts of many volunteers and interns. If you are interested in volunteering, please use the contact form on this page and we will keep you informed about volunteer opportunities as they arise. Midway’s staff is periodically available to talk to classes and participate in studio visits. If you would like to know more about off-site visits, please contact us. 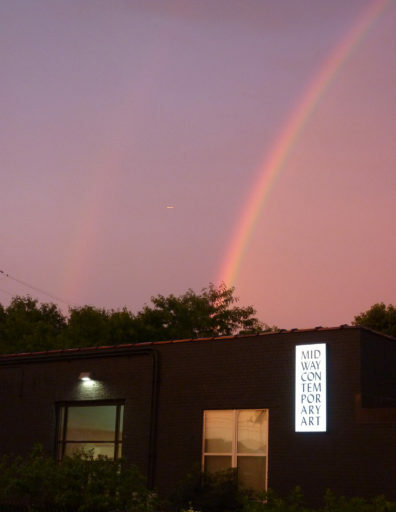 Midway Contemporary Art is not accepting artist submissions at this time.